* CD - Remastered audio on two CDs, plus 24-page booklet. * Streaming & Digital Download - Remastered audio. * Super Deluxe Boxed Set. 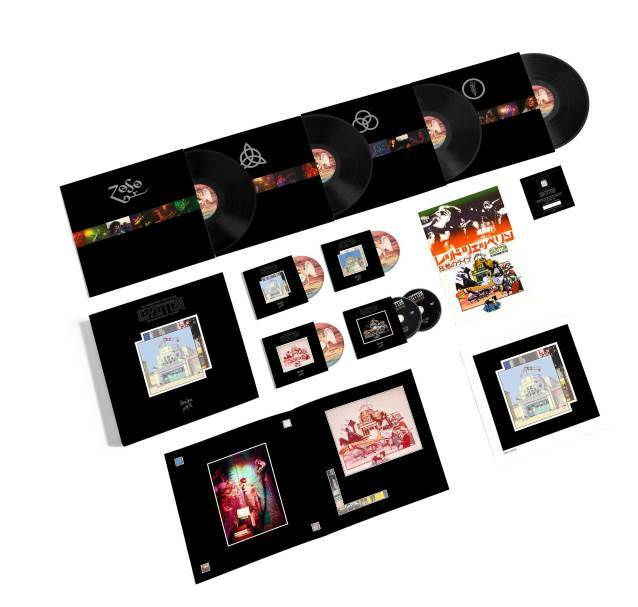 - Remastered audio on two CDs and four 180-gram vinyl LPs. - Two-DVD set of the "The Song Remains The Same" featuring the full theatrical version of the film plus bonus content including four performance outtakes that were not part of the original film: "Celebration Day", "Over The Hills And Far Away", "Misty Mountain Hop" and "The Ocean". - DVD of the entire album in Dolby Digital 5.1 Surround and PCM Stereo, plus photo gallery. - A 28-page book featuring band photos and stills from the film and an essay by Cameron Crowe. - A replica of the Japanese program from 1977, previously available only when the film first toured cinemas in that country.